The last 4 periods of 13 days (called Wavespells) were very intense and working for this years energy: purification. Skywalker (sept 8 – 20) took us out of our comfortzone to let go of limiting beliefs and prejudices. Worldbridger Wavespell ( sept. 21 – oct 3) helped us to let go and forgive…on a deep level, changing our DNA, to establish a new YOU. Don’t be afraid. Let go and forgive. If you can’t, the Storm Wavespell (oct 4- 16) will come to rip it apart. Hold steady and let Storm do its work. Let it be transformed. Use the energy this process creates. Human Wavespell (oct 17 – 29) is the power of Free Will – everything is a choice. How you see your life, how you experience what happens to you is your choice. What is it for you: you want to be the victim or the master of your own life? 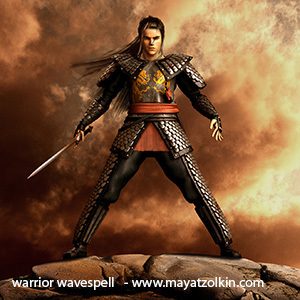 From May 14 to 26 we are in the Warrior Wavespell. It is a spiritual warrior, a warrior from truth. Warrior is the power of fearlesness. He has the courage to step forward in difficult situations to defend his truth. Warrior collects wisdom by asking questions. Who ask should be ready to receive the answers. He who is able to listen to it will be really wise. She arrived! From today you can order the 13-Moon Diary for the next Moon year. The first reactions are very good! It is even more colorful then former years. And for ‘starters’ easier to find your way. Check the preview and order here. Don’t be a Donkey, go monkeying around! Have fun. Take at least once a day a time to play! Humans beings are able to fully enjoy the world around them, feel their heart open when they see and smell beautiful flowers. Open your heart, trust and enjoy. If – after the previous two Wavespells – there are still things you don’t really want to face, the Storm Wavespell will be merciless. It will not be subtle: after all, a mild breeze is not a storm. Know, however, that this only occurs to purify and transform you. If everything remains calm in your life, don’t forget you might end up in somebody else’s storm. Remain calm. Storm also gives you great power; you have much energy to deal with all sorts of things. Put your shoulder to the wheel! Things will change…so you better remain at the helm and stay on course. Enjoy the ride.